It's term that has changed a lot in the past ten years ago. Even five years. One way to approach self publishing is to host a personal blog, like this site or Shawnblanc.net. This type of setup is fun because it's so flexible. Running a site under your own name allows you to write on any topic that interests you. Another approach is to be focused. Take one subject that you're passionate about and stick to that. I like this concept as well because, if the publisher follows the general rule-of-thumb, you know what you're going to get as a reader. As well, the publisher knows that his regular audience is indeed interested in the topic. But a third option is emerging. It's almost a blend of the two — a personal site (perhaps stream is a better word) where the content is focused on one thing only. 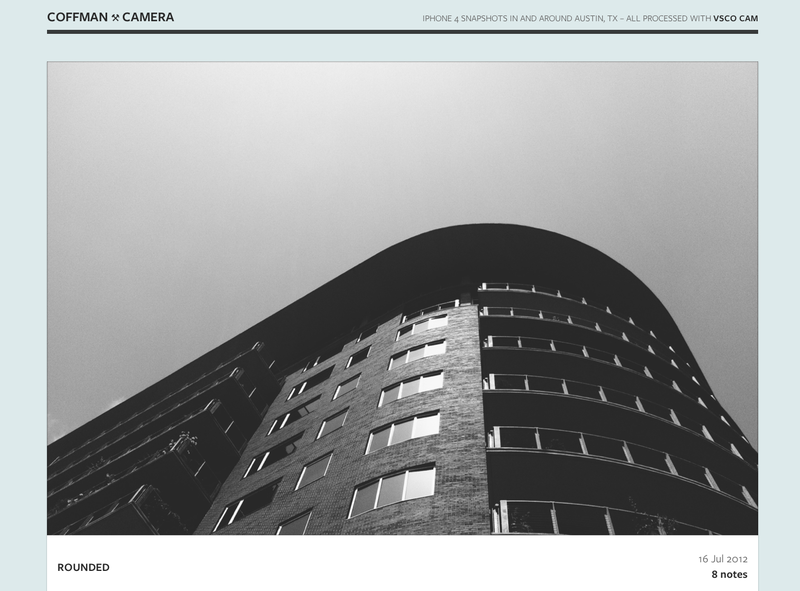 A perfect recent example is Coffman Camera, a photoblog from Method & Craft creator Phil Coffman. It's a beautiful project — a minimalist but stylish site with large, tasteful photographs. The focus is on the images and art direction Phil takes with his tools, but all wrapped up in a stylish package. Not only that, but the tools we have available make a process like this both easy and fun. Phil is using VSCO CAM on his iPhone to take his photos and Tumblr to publish them. I don't know the exact details of his setup, but it's not difficult to guess. A few minutes of tinkering and I was up and running with the same setup to post images from my iPhone camera app of choice (Path), posting images to my Tumblr account. We can share these moments, these artifacts of our creativity with such ease in 2012. It amazes me. At the same time, it causes me dwell for a moment on curation (a subject dear to me). Not only do we need to sharpen our focus with our input, but with the frictionless of today's self-publishing, we also need to rein in our own desire to share. That is something this guy admittedly struggles with and spends a lot of time thinking about. But I know this — our output needs a sharpened focus as well.